As a jewelry designer, I’ve wondered if I was born with a defective gene where it comes to engagement rings. I’ve never been a fan of the “rock”, nor do I like prongs that elevate said rock so that it sticks up high above the band. 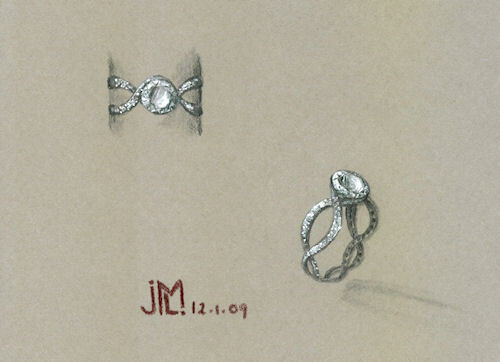 In my ring designs, I tend to gravitate towards little diamonds (lots of them! ), bezel settings, and wider filigree bands. Tonight I decided to put my efforts into designing a more traditional engagement band featuring a large center diamond. The result is my “twist” on the traditional.